This entry was posted on February 19, 2014 by Ashlea Jade, in PROJECTS and tagged construction, Decor, Decorator, design, designer, Hoboken, interior, Interior Decor, Interior Decor Hoboken, Interior Decorator, Interior Decorator Hoboken, interior design, Interior Design Hoboken, Interior Designer, Interior Designer Hoboken, renovation, Swift Morris, Swift Morris Interiors, the bloomfield project. Bookmark the permalink. 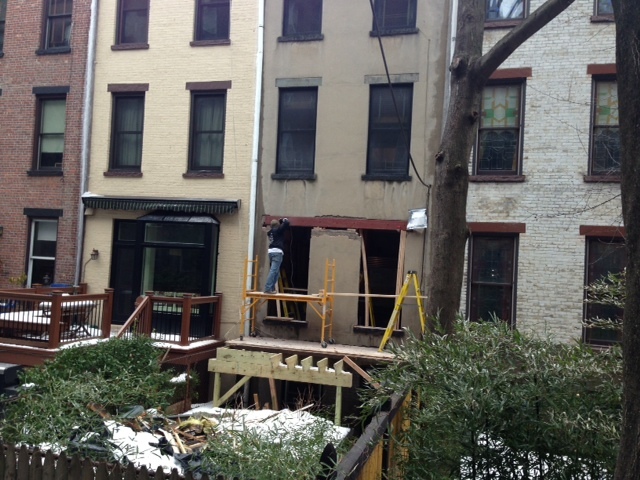 February has been another busy month at the Bloomfield Project. 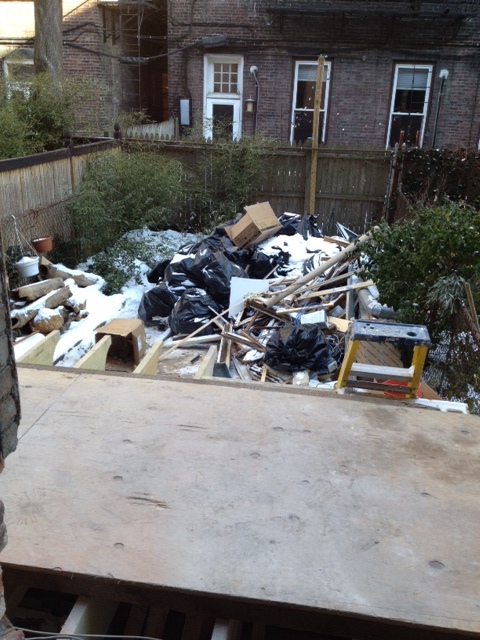 The picture below of the debris filled garden should give you a pretty good impression of what we have been up to; scrapping the old and replacing with the new. Scroll down below to see all the positive progress that we have been making this month, in spite of the brutal weather! As we revealed in our January post, a beautiful big bay window will be a new feature for the kitchen area. However, before we could remove the wall and fit the window, structural preparations were crucial. Below, a structural steel beam is installed by Kieran, our main carpenter. He was clearly not bothered at all by February’s frigid temperatures, working outside and braving the freezing cold and snow! 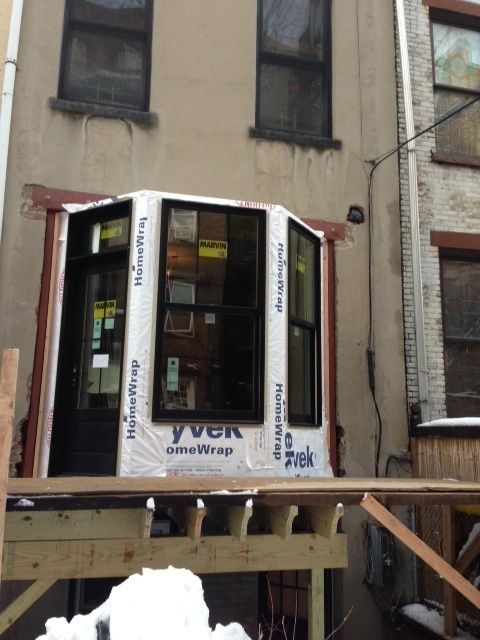 With the steel support frames and beam in place, the bay window was installed. 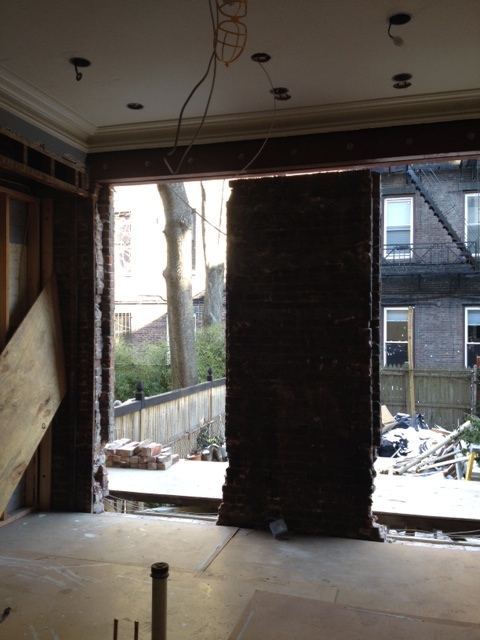 We can’t wait to see how the light and space gained from this feature will drastically transform the kitchen. Another great re-allocation of space will be the conversion of an old closet into a men’s bar. 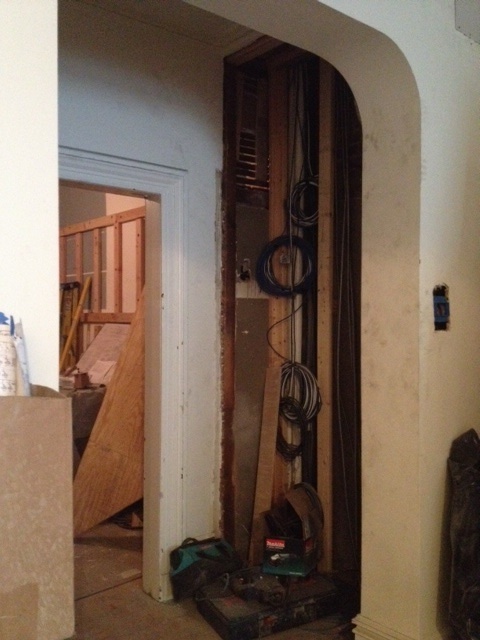 Pictured below, the area is ideal for running the roughing plumbing and electric through the walls. We will keep you posted on how this space becomes transformed! 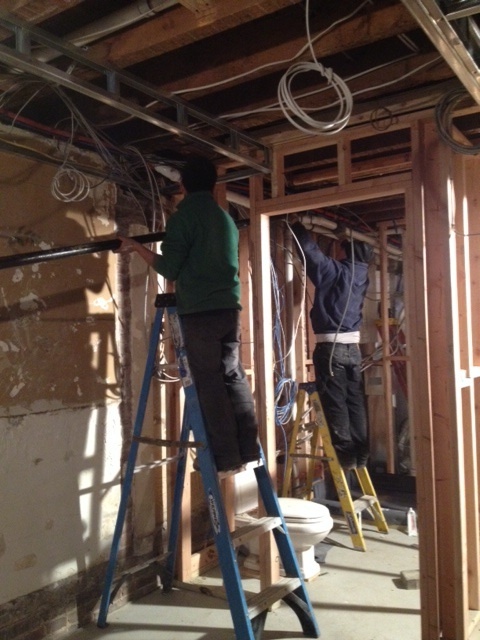 Down on the ground floor, the men install all new gas pipes… while they were at it, we thought they might as well change everything to new! 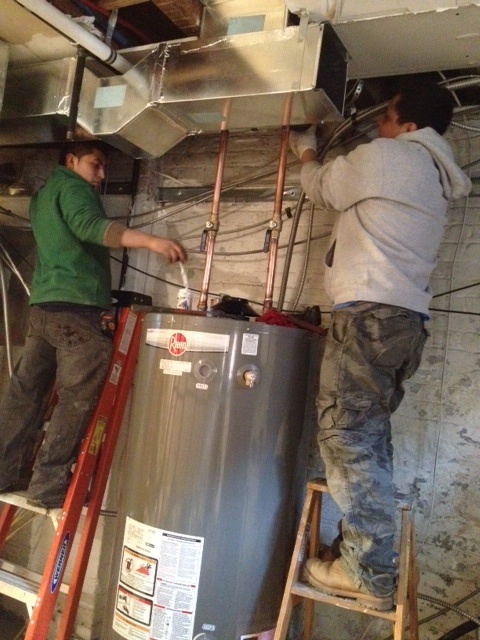 Below, you will see the new 75 gallon hot water heater which replaces the two less energy efficient, 40 gallon heaters. Now, who needs a hot shower? 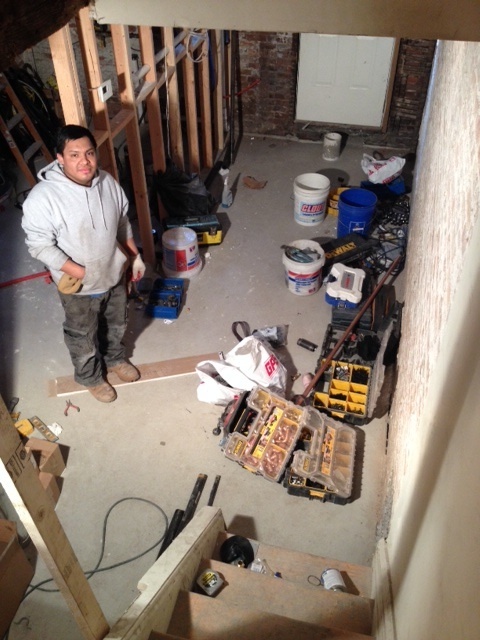 A dedicated plumbing team member is asked to pose for the photo with the new concrete floor. 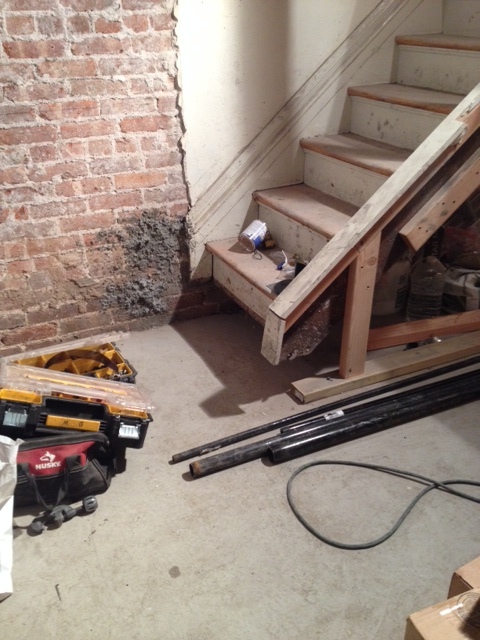 With the new now in place, the basement gained an extra 8 inches in height! 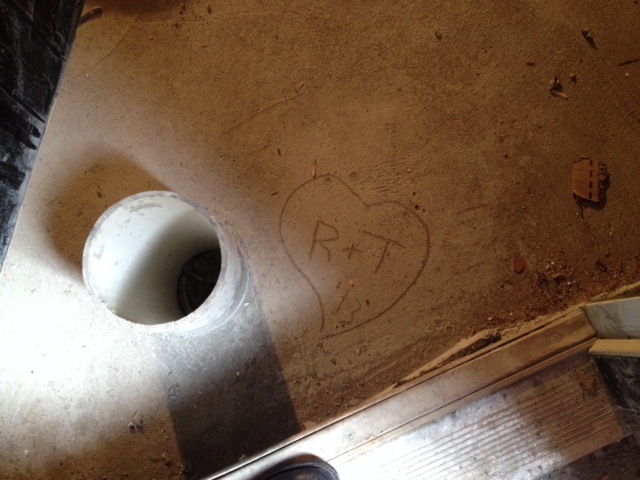 Just in time for Valentine’s Day, before the new concrete floor had time to set, Tim and Ruth romantically etched their initials and a love heart, with the number ‘13’ (the year that the project began) into the basement floor. How romantic! As you can see, February has been another great month of positive progress for the Bloomfield project. By the end of this week, all of the roughing inspections should be completed, after which the pace of construction will pick up dramatically. We look forward to updating you on our latest developments soon, but until next time, happy Valentine’s Day!